The United States seeks to maintain and strengthen ties with the United Kingdom on many levels. The British American Parliamentary Group exchange program is an annual initiative, commenced in 1977, to promote friendly relations and mutual understanding between the two nations. Through the U.S. Department of State’s International Visitor Leadership Program, this annual exchange welcomes British Members of Parliament (MPs) to the United States to explore U.S. politics and the legislative process at both federal and state levels. The program begins in Washington, DC, where the British MPs meet with several U.S. government representatives and non-governmental leaders. These encounters provide an opportunity to develop contacts with members of Congress, to understand different players in the U.S. political process, and to examine domestic and foreign policy issues that drive politics. Each MP is also matched with a counterpart in the U.S. House of Representatives. The House Representatives then host the MPs in their home districts and provide insight into U.S. politics at the local level. 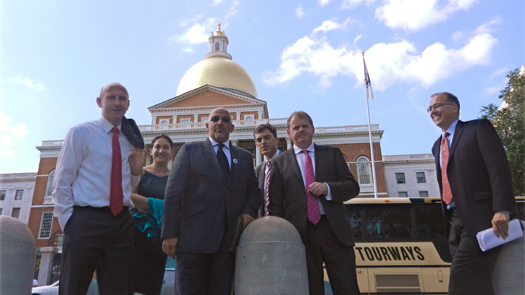 Finally, the MPs visit Boston, Massachusetts to observe the state legislative process and visit a state capital. Throughout the exchange, participants have the opportunity to network with counterparts and staffers, examine the media’s role in the U.S. political system, discuss significant domestic and foreign policy issues, and experience U.S. pluralism and regional diversity.